The Winnipeg Jets have had an uneven start to the 2018-19 regular season, currently sitting at 2-2-0 and fifth in the Central Division. In two of their games, they’ve looked like the juggernaut and Stanley Cup favourite many have projected them to be. In the other two — especially in their most recent outing against the Nashville Predators — they’ve looked undisciplined, scrambled, and discombobulated. 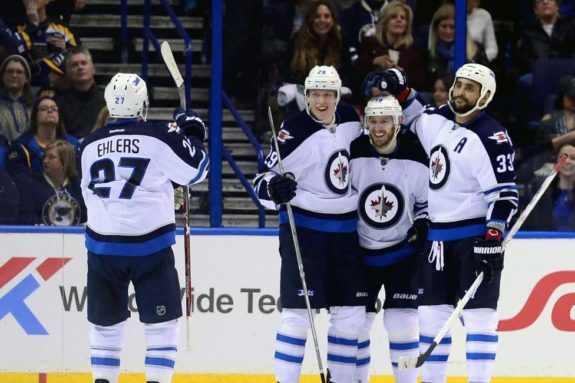 The Jets have returned to friendly Manitoba after getting shut out in ‘Smashville’ on Thursday and will begin a season-high six-game homestead this Sunday against the surprising Carolina Hurricanes. Although it’s early, it’s a homestand they must do well on if they want to replicate last season’s success. The Jets’ success at Bell MTS Place last season was one the main factors that led to their 52-win season. Manitoba may be friendly and welcoming (it’s on the license plate), but the Jets were certainly neither friendly nor welcoming to opponents last year. They simply dominated in downtown Winnipeg, posting a ridiculous 32-7-2 regular season record on home ice. In January, they went 6-3-1 in a franchise-high ten-game home stint, and in March, they really poured it on and swept a six-gamer. 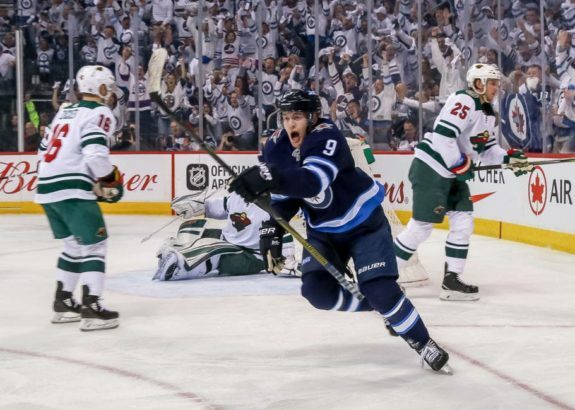 The Jets’ top five point producers seemed to find another level at “The Phone Booth” – Blake Wheeler, Patrik Laine, Mark Schiefele, Nikolaj Ehlers, and Kyle Connor produced a combined 338 points last year, and 197 of them (58.28 percent) came at home. Of course, the Jets’ home triumphs didn’t end when the regular season did — they captured five out of their nine wins at home, including three straight against the Minnesota Wild in the first round. 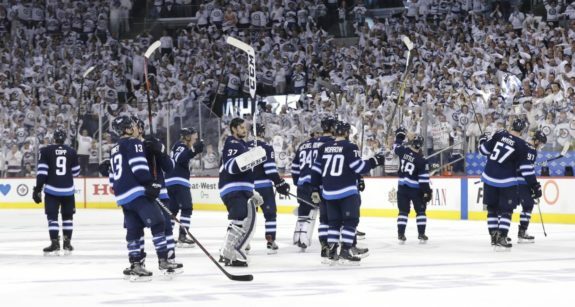 In addition to all the factors that made them surly hosts in the regular season, the Jets’ fans provided a tangible X-factor and contributed to an intimidating atmosphere. 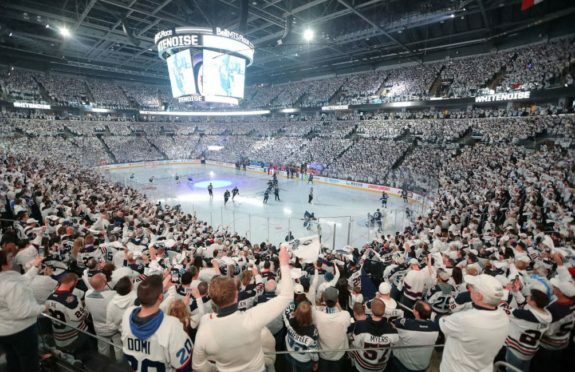 Donning everything white — from Elvis-era jumpsuits to wedding dresses — rabid fans packed Bell MTS Place. Those without tickets flocked to the streets for raucous whiteout parties, the attendance of which often surpassed the arena’s crowd. The parties thrust Winnipeg into the national spotlight and boosted civic pride to never-before-seen levels. The six-game homestand — which sees the Jets face the Carolina Hurricanes, Edmonton Oilers, Vancouver Canucks, Arizona Coyotes, St. Louis Blues, and culminates in a clash of the class of Canada against the Toronto Maple Leafs — provides the Jets a very good opportunity to get ahead and some issues sorted out. Out of those squads, only the Maple Leafs qualified for the playoffs last year. First off, it will allow the Jets to establish a routine their schedule has not afforded them thus far. For the next 11 days, players will have the privilege of being able to go home at night, sleep in their own beds, and not have to deal with the hassles travel —even charter flights — can bring. The Jets, beginning Sunday, play every second day through the end of the homestand on Oct. 24, which means they’ll get into the familiar game-practice-game-practice cycle. Never underestimate the role of stability in success: last March, as previously mentioned, the Jets swept a six-game homestand under similar circumstances. While the Jets will play back-to-back games 10 times this year, the homestand features none. “This allows the players plenty of time to get into game shape before playing their first games on consecutive days,” wrote Kyle Buhler of Jets fan blog JetsNation. The favourable schedule and return to routine could bode well for the Jets’ slow starters. While the top line of Blake Wheeler, Mark Scheifele, and Kyle Connor is producing, the second line of Nikolaj Ehlers, Bryan Little, and Patrik Laine is not. The trio has combined for just one point over the first four games — which came on a Patrik Laine power play goal in the opening minutes of the Jets’ season opener on Oct. 4 against the St. Louis Blues — and have been sub-par thus far. The homestand presents an opportunity for the Jets bottom-six in addition to the slow starters on the second line. The Jets were successful last season because had four lines that could score at any time. However, secondary scoring has been a big issue through the first four games — Mathieu Perreault and Andrew Copp are pointless and Adam Lowry, Jack Roslovic, and Kristjan Vesalainen have just one point each. Goals came in bunches for the Jets at home last year — they scored five or more on 13 separate occasions. So far this season, they have just eight goals and three in their last three. If history repeats itself and the Jets can pot some goals and put up some W’s, it will go a long way toward building momentum as they enter a tougher portion of their schedule. It will help renew their confidence and put them in good position in the Central Division standings. Four wins would likely be enough to do that. Though some may view mid-October games as lower-stakes than games down the stretch in mid-March, points earned early have never been worth less than points earned late. The Jets’ Central Division rivals stocked up over the summer and are strong as ever, with a combined 12-5-4 record through Friday. A bad start in the Central can bury any team, even a team as deep and ballyhooed as the Jets. Although it’s early, the next six games are pivotal for the Jets. The homestand presents the team with a myriad of opportunities they cannot afford to miss if they want to replicate or improve on last season’s second-place finish.